Major advances have occurred in almost every aspect of the diagnosis and treatment of lymphoma in recent years. Our understanding of the molecular biology and genetics of the disease has increased exponentially, and significant developments in imaging of this malignancy have resulted in earlier and more accurate diagnosis. At the same time, advances in therapeutic immunology have led to the development of several new treatment options. This landmark new text describes these advances in a single concise volume, placing them in the context of daily clinical practice. Introductory chapters review epidemiology, prognostic factors, imaging and therapeutic immunology. 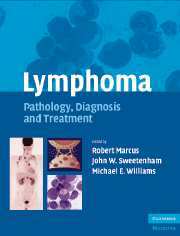 These are followed by chapters on each lymphoma subtype, dealing comprehensively with all aspects of the diagnosis and treatment of the disorder. Highly illustrated in full colour throughout and written and edited by the leading authorities in the field, this book provides all the information needed to diagnose and manage these complex disorders. Autore: Marcus R., Sweetenham J.W., Williams M.E. 17. Lymphoma in the immunosuppressed Michele Spina, Robert Marcus and Umberto Tirelli.